The teams are the cells of the organization and so they need to release the positive energy that enables progress and balance. For a team to perform, the individuals need to address the hidden and surface issues that are blocking synergic interactions. Executive Team Development is a team coaching program for 3 to 12 months that targets real time redesigning of the essential processes leading to a more powerful and dynamic executive team. 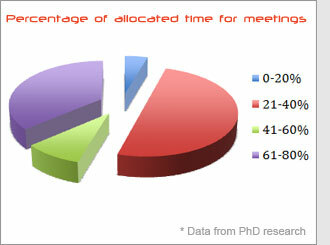 Over 60% of the managers are spending between 20 to 80 percent of their working time in group meetings.